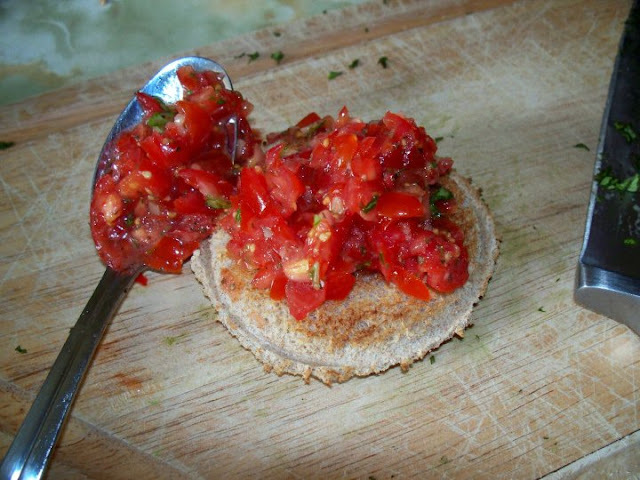 Easy Apps – Bruschetta | Dylan Cooks. Ever go to a potluck dinner and have no idea what to bring? Well, look no further–bruschetta is one of those always-impressive yet surprisingly easy appetizers to make. When made correctly, it will always stand out as one of the most vibrant–and delicious–appetizers at any party. The key to making a great bruschetta is using really, really fresh ingredients – nothing canned and definitely no dried herbs. Whenever I make bruschetta the amount of each ingredient always tends to fluctuate, so most of what you’re putting in is going to be until it’s to your liking. However, here’s a sort of basic recipe/guideline to follow the next time you want to bring a stand-out dish to a party that requires hardly any effort! Cut the baguette into 1/4-inch slices, toast, and place a large spoonful of bruschetta on each piece. Enjoy!